Basically, I have a positive attitude towards the Cartier brand, wonderful advertising clips and the watches, oh yes, I could get into raptures, can afford or want a perfume of the house, but I would most likely then. What I haven't done yet, though, my review is based on a sample received. The attitude towards the brand was one of the reasons why I applied the test strip to a test strip at first, but a minute later so immediately on the skin. "Beautiful" was the first thought, in the course of the test wearing I still remembered associations like "feminine", "detergent", "powdery", "at home", "family" and... "Heike"! The memory of Heike came to my mind... Fragrances and memories, the themes go hand in hand again! At the beginning of my studies many years ago I was in a flower shop, it was probably because of a birthday flower...you know that... And although as a student I should have put my money into better nutrition...I bought a lily there and baptized her Heike. She then stood in the kitchen for weeks, where I enjoyed her. Implementation of lilies in meringue Volé, I would say very good if it evokes in me the memory of real lilies. Unfortunately the durability is quite short, it was enough on the skin unfortunately only for half a day fragrance experience, on the clothes much longer, but I know Cartiers who create more! Regarding the associations that can be made with lilies, or which they occupy thematically, the scent is certainly a double-edged sword. But since lilies are the only flowers I like comparatively, I could live well with a fragrance with this multi-faceted flower. Altogether I am glad that I could make this "smell memory", in order to be taken up as Flakon into my collection, it lacks for my taste however unfortunately evenly at perseverance. Base Notes: Lily, Green Notes. I wanted to explore more white florals as of late, especially lily-centric white florals. I was keen to try Lutens Un Lys, but given Un Lys's $300 price point for a 75ml bell jar, I decided to begin my journey elsewhere, specifically with Cartier Baiser Volé and Guerlain Lys Soleia. This review is specifically for BV, but I do compare and contrast the two fragrances to point up how their differ from one another in the white floral genre. On the whole, BV smells exactly like its notes pyramid. I detect more citruses in the top notes than I do lily, but the lily comes through more in the heart and the base notes where it becomes creamy and slightly sweet. BV is also quite fresh and green. It is the sort of fragrance that one could easily to one's office, school, church, a nice luncheon, a wedding, etc.. It could easily be worn day or night. My guess is that it wears better in the Spring and Summer, but I see no reason why it could not be worn year round. BV is nice enough. I want to test it out of doors soon to see how it develops in the heat and humidity before I pass final judgment on it, but at the moment, it is not something I would ever repurchase unless subsequent wearings impress me more than the first two wearings. I absolutely love the bottle, though! It is difficult to describe, but the bottle feels rather heavy and quite posh in my hand, and the overall design has a fine aesthetic quality that I almost never find in other contemporary fragrances. It is difficult to spray, but I am not sure if that may be a flaw in the atomiser on my bottle or not. I had roughly four hours longevity from it last evening. By that time it was fading pretty quickly, but my skin was quite cool. Perhaps I would have greater longevity if my skin had been warmer. Anyway, at that point I applied the LS over it. (The first time I have ever layered fragrances.) I do not know if the layering of the two was responsible or not, but I could still smell the LS this morning whence I awoke. Whilst I like BV well enough, I am much more enamoured of LS, but this does not surprise me because Guerlain rarely disappoints me. Honestly, some may mistake BV for an air freshener whilst others may mistake LS for a B&BW body spray except that LS smells like a higher quality fragrance, better ingredients and better blended. The ylang-ylang in it is delicious--sweet but not at all cloying. It is so well blended that I cannot disentangle the ylang-ylang and the lily notes. It is as though they are two sides of the same coin. It is definitely a lovely fragrance for the Spring and Summer. It does not smell the same as Terracotta Voile dé Été, but it is in the same "style" if that makes sense. Both have a light sweetness and warmth about them and project mildly in wafts. I like the bottle, too. It has now been twelve hours since I applied LS over BV, and I can still smell LS on my skin albeit faintly. I did not expect performance as good as this, so I am pleasantly surprised. My white floral lily-centric fragrance journey will not end with either BV or LS, but they have given me a great start. If you wish to explore lily-centric fragrances, and if enjoy fresh, green fragrances, ones that are crisp and cool as opposed to warm and sweetish, then BV is a good place to start. If you think you would enjoy a slightly more complex and sweeter fragrance, one that is warm and more sensual, then LS is a good place to start. On the whole, BV rates a basic thumbs up for delivering what it promises to deliver. LS gets a more enthusiastic thumbs up for not only delivering what it promises to deliver but also for being beautifully blended, warm, and sensual. At the end of the day, both have a place in one's wardrobe if one wishes diversity in her lily-centric white floral fragrance section. An artfully balanced harmony of lily, topped with a sparkling green aureole of leaves. Don't underestimate it, because it is a "soliflor". It is clean and clear in the beginning, but it has a darker, quite melancholic side to it, too. Wear it on a summer day, but put it away at night, it will not perform any "seduction miracles" for you, since it's too "gloomy". It emanates the beauty of the white lily, reminding me of white lilies in a stylish vase on a tombstone. In another review I once wrote that it's "old-fashioned in a good way". Smelling it again today, I still think it's elegant, but I personally don't wear it because of the graveyard-connotations. I reviewed Cartier BAISER VOLE eau de toilette a while back and found it to be a vegetal green scent similar to the milk which drips inside the green stems of some plants. It initially reminded me more of violet leaf, but eventually I came to believe that it might be the scent of the inside of the stem of a lily plant. When I first donned BAISER VOLE eau de parfum, I was convinced that I smelled magnolia in this composition. Only lily is listed in the note hierarchy, but the floral scent seems so much like a cross between magnolia and lily to me that I even reached for my Elizabeth W magnolia candle to compare the two. It may be that the sticky base is creating the illusion of magnolia here. Unfortunately, despite my fondness for both lily and magnolia, this creation does not really sit well with my nose. I'm pretty sure that the base is the culprit here, making the perfume smell slightly off-kilter and a bit uncomfortable. I suspect that the concept was to make a seductive, slightly dirty, but still mass-marketably sweet lily perfume. It actually smells a bit obscene, but in an embarrassing, not an appealing way. Not for me. 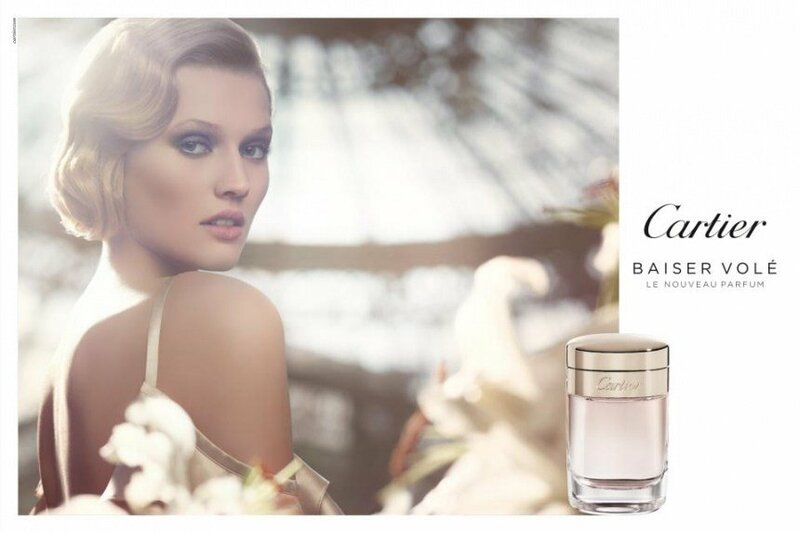 Cartier Baiser Vole, was a newly released fragrance I was quite looking forward to trying. Lily is a beautiful note when blended skilfully, so I had very high hopes for this one. After I had applied Baiser Vole to my wrist, I found it did not remind me of fresh lilies at all, but of another popular fragrance which I had worn once or twice. It took me a good hour or so to figure it out. I kept smelling citrus and a faint play-doh accord, and then it hit me. Baiser Vole's top notes smelt like Daisy EDT by Marc Jacobs. There were obvious similarities, however only in the initial stages was it particularly Daisy like. The heart was much smoother and introduced an element of powderiness. The lily accord in Baiser Vole prefers a muskier and soapier finish, rather than the green freshness it is known for. It's quite a polite type of fragrance, tending to come and go in terms of projection on the skin. I'm not really thrilled with this fragrance, in fact I wanted to experience so much more. The musky and citrusy notes kind of spoilt the lily in my opinion and damaged it beyond repair. Baiser Vole is a great choice for all seasons. In some ways it would make an excellent staple scent as it seems to find that middle ground in terms of preferences. There are many classic Cartier fragrances that I really enjoy, like Panthere, Must de Cartier and Le Baiser du Dragon. Unfortunately, Baiser Vole didn't have that same strong character that previous Cartier scents have had. The longevity was not too bad on my skin, however I do wish the sillage had more 'oomph'. I do believe I'll be passing this sample on. When I tested this on skin it smelled like a vase wich water has turnt old. Write the first Review for Baiser Volé (Eau de Parfum)!